Rose Quartz is often called the "Love Stone" and its energetic hallmark is that of unconditional love that opens the heart. The high energy of Rose Quartz gives it the property of enhancing love in virtually any situation. Bringing love into life and daily situations not only brings inner warmth, but it also lowers stress and soothes those around it. Believed to protect Mum during pregnancy and childbirth, the energy of Rose Quartz is also gentle and nurturing during labor and childbirth bringing more serenity to the birthing process. It is useful to balance emotions, bring peace and calm and to relieve anxiety. Place the whole Baby Bonding Bracelet or just the detachable heart under your pillow after childbirth, for a more restful night’s sleep. It will help to soothe negative influences, replace negativity with harmony and ease emotional imbalance. It’s also highly practical for busy, exhausted new moms - just switch wrists to remind which side baby nursed last. The Rose Quartz Baby Bonding Bracelet is perfect as an original pregnancy gift, as a small baby shower gift, or as a unique present for any of your loved ones at anytime. 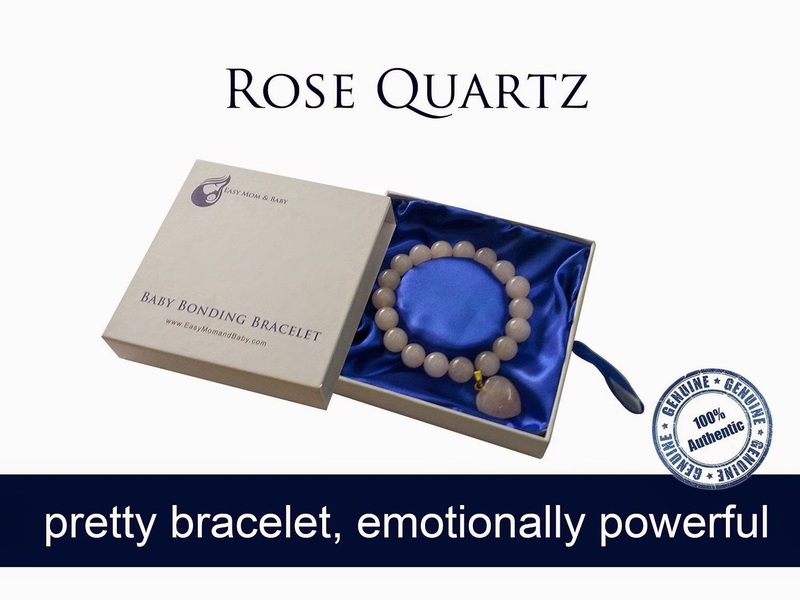 THE BABY BONDING BRACELET is beautifully crafted from natural Rose Quartz. This semi-precious stone is universally known to evoke greater love and affection. 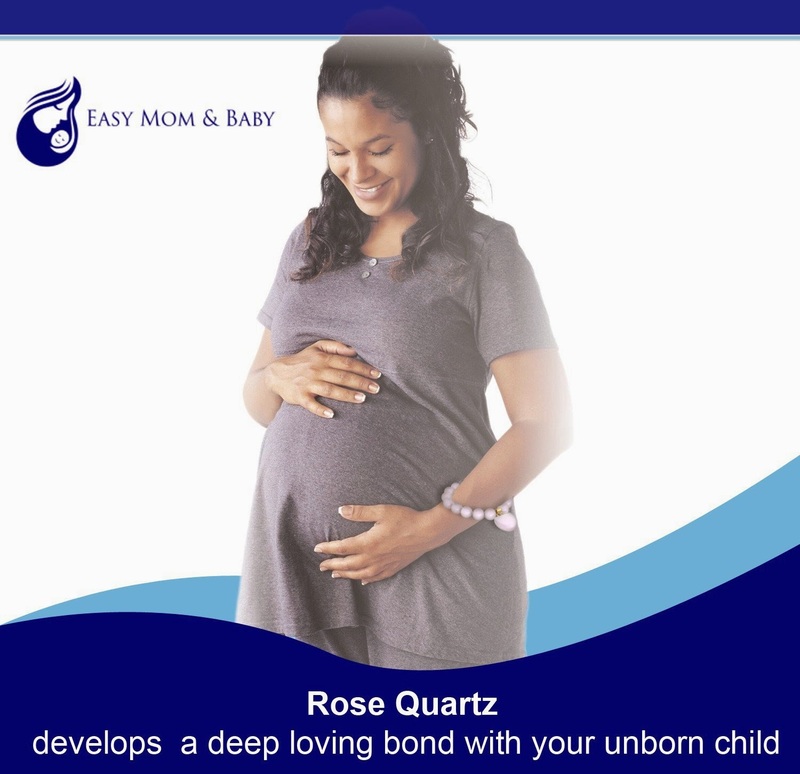 Believed to protect Mom during pregnancy and childbirth, Rose Quartz is also the most powerful of fertility gemstones. Wear your Baby Bonding Bracelet during pregnancy to develop a deep loving bond with your unborn child. Wear your Baby Bonding Bracelet when breastfeeding to promote bonding and intimacy. Wear it or place it under your pillow after childbirth, as Rose Quartz opens up the heart for both giving and receiving love. It soothes negative influences, replaces negativity with harmony and eases emotional imbalance. Highly practical for busy, exhausted new moms - switch wrists to remind where baby nursed last. Perfect as small baby shower, pregnancy or new mom gifts, or simply as a unique gift for any of your loved ones at anytime. WE LOVE TO GIVE BACK. 5% of our profits UK and USA are donated to breast cancer charities. This beautiful Rose Quartz 18 stone bracelet with the sweet heart is an adorable gift for new mothers or mothers to be. This "Love Stone" has a history of enhancing love. I like that idea and I think any new mother would too! The bracelet comes in a beautiful box, perfect for gift giving. I like that a nursing mother can wear this bracelet and switch to the left and then right wrist to remind them which side their baby nursed last. It is nice to know that this company also gives back to Breast Cancer Charities.